With five little learners ranging from a fifth grader doing junior-high-level work to a tiny tot, stacking blocks and sorting colored pom-poms in muffin tins, my home is a daily frenzy of activity. Couple that activity with the INDEPENDENT spirit of nearly all of my kids, and you have the makings of a school day that could easily become disjointed. While I encourage all of my kids in their individual passions and gifts and support independent courses of study, I also know that one of the biggest strengths of HOMEschooling is schooling in the HOME...schooling alongside and with your siblings...making memories together...forming lifelong bonds. Early on in our homeschooling journey, I determined that chunks of our day would be spent intentionally learning TOGETHER. With purpose, I begin each school day with all my little chicks huddled around my lap...or crawling into it, as the case may be, to enjoy some much-needed GROUP LEARNING time. After they've mentally checked off all the items from our Good Morning Board, my kids gather in the living room for a homeschool version of "circle time" and our Start-the-Day-Together Basket. Often used in preschool classrooms, circle time is a daily group meeting of sorts where everyone gathers together...often in a circle...to greet each other, discuss the days' TO DOs, and complete a few simple group activities. It's a great way to start a busy, everyone's-going-in-their-own-direction day with unity. What does it look like in our home? With firm resolve, I attempt to recreate that morning time unity SANS The Hubs. A hybrid circle-time has always provided a nice group start to our day. I always begin with a song. I read a short excerpt from one of our basket books. These readings are always short...2-3 minutes a piece. This has been a great way to enjoy some non-fiction, topical-type books that do not necessarily fall into any particular subject category or may not easily weave into other group times in our schedule. I rotate songs and books until we are done. I am a firm believer that children...especially young children...have much more educational success when their learning follows a rotated pattern of physical movement and sedentary mental focus. In other words, after they sit for a while in deep concentration, they need to MOVE. Once they move, they can sit for a while in deep concentration. It's a pattern I weave into EVERY aspect of our day...not just our school day. For this reason, we rotate the singing of an active song (which require clapping and sometimes hand motions) with a short reading from one of the books in the basket until all the books have been read. I give any scheduling announcements. My kids, like most kids, like to know what to expect from the day ahead. If we have an appointment, a field trip, or really ANYTHING that would veer us off "the norm", I make sure to end our circle time by letting everybody know about it. Often times, I will announce early on in the day, before we even start circle time, that I have an "announcement." The build-up of curiosity helps to motivate the kids to come to circle time without even having to be asked. What is in our Start-the-Day-Together Basket? Every year, our basket and its contents look a little different. It, like every other aspect of our homeschool, has to ebb-and-flow with the current needs of the family and its little learners. This year, our basket is filled with the following gems. English From the Roots Up -We learn one new Greek/Latin vocabulary root each week and review old ones. Manners Made Easy for Families -This book is set up like a daily devotional book. We read one page each day. You Can Change the World -Each two-page spread of this missions-focused book emphasizes one country or unreached people group around the world. We usually read these spreads over the course of two mornings. a world atlas-When we begin a new country/people group in our missions book, I like to refer to its location in our atlas. Occasionally, I'll add other things to our basket such as articles about current events or short picture books about upcoming holidays. What else could be included in circle time? With its modest basket of group activities, our daily circle time has been one of the most unifying elements to our crazy-busy days. They are actually homemade books I typed and printed for my former classroom students. I taught in a Christian school and taught my students many of the same songs I'm attempting to teach my kids. I just basically made a list of all the songs we learned together, typed the words out and put them together in a booklet. But you could do the same thing with all the songs YOU KNOW and WANT to teach your kids. I actually should take the time to edit them and add new songs that aren't in them that my kids and I have enjoyed. GREAT idea! Thank you for sharing! 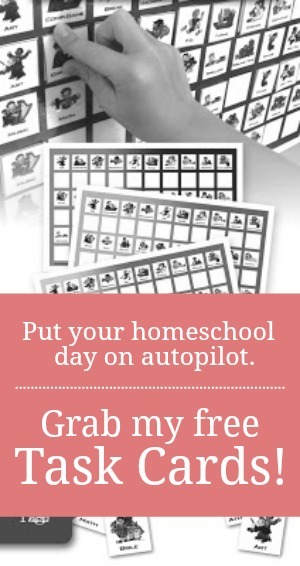 It's so helpful to me to read how other families homeschool. Wonderful idea! We do a together time in the morning that is similar, but a little different. (Isn't that just the way it is with so many individual things! Lol) Since my oldest is a bit older than yours, and my kids are spread out a bit more, we really don't have have "across the board" learning right now. But we do still start as a family, praying together, and ruminating over the day. Perfect way to get off to a great start! And that really is the whole point. It doesn't really matter what "material" is covered during this morning time. It only matters that it is done TOGETHER. Sounds like you start your day out well! What a fantastic idea! I plan to implement this as soon as we start back up next week! You'll have to come back and tell me how it goes. I'd love to know! Love the basket idea. Genius organization. Love this! Great explanation of how Circle Time works for your family. I've been wondering how to get those Greek/Latin roots into our routine :) I pinned this to the Preschoolers and Peace Circle Time Board. We keep our roots practice very simple. But simple helps to ensure that we get it done. This is really cool! I have a question 3 of my four kids are emergent readers. Are they going to get anything out of english for the roots up or is it really for older kids? Is there a better vocab. curriculum that would work better for this age group? I've really been enjoying your sight!! I would hold off on English from the Roots Up. My five year old keeps up with us, but doesn't seem to master the words as well as my older two. And in actuality, I don't think vocabulary is really even necessary until third grade when they will be reading to learn instead of learning to read. This is similar to what we do and challenges me to add in a couple of things that I've been thinking about but not acted on yet. I have 8 children 15 years to 13 months so it can be challenging to hold everyone's attention. I like your idea of varying the activity level and keeping the segments short. You are one busy momma, I'm sure! (I'm stating the obvious, I know.) 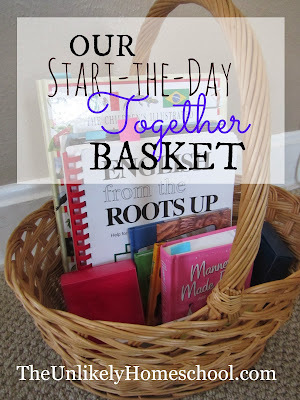 A morning time basket just might help to unify your start. Welcome! Welcome! Yes, I worked for them for several years, taught their curriculum at a Christian school, and now enjoy using elements of their curriculum in our homeschool. I can't think of a better curriculum for teaching reading. I'm starting Abeka with my 3rd grader in the fall. I did Abeka through 8th grade when I was homeschooled, so I'm familiar with it. I am hesitant to try it with my Kindergartener. Would the reading program still work for a kinesthetic learner? I bought it a few years ago when it wasn't quite so expensive. The hard back version is out of print now, so that's why they are more expensive. Do you do this before eating breakfast? It takes us so long to eat and do our morning chores (make beds, get dressed, etc.) that by the time we're ready to do school, I just want to get at it. But, I'm definitely in need of something to help us come together in the morning. I love all of these ideas! Can't wait to start using them this school year! Thank you so much! You're most welcome! I hope you have a great school year.